In global terms it was no great shakes, particularly as it hit a few weeks after the San Francisco earthquake. 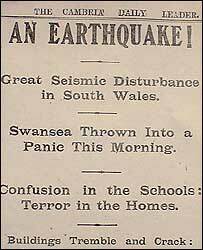 But 100 years ago a quake hit Swansea, wreaking damage throughout the city and bringing panic to the streets. At 5.2 on the Richter scale it remains one of the UK's larger tremors, and was felt over much of south Wales. 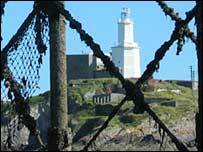 Contemporary reports tell of falling bricks and chimney pots, children being evacuated from school and Mumbles lighthouse wobbling on its foundations. Injuries were minimal, with one young man and a three-year-old boy needing hospital treatment after being hit by bricks and a girl working in Cwmavon being badly injured when tin plates toppled on to her. It was reported that a miner at Seven Sisters Colliery was killed - but in fact he died the following day after being hit by a rock fall that was unconnected. The earthquake hit on the morning of 27 June 1906. Fortunately for Swansea, it was a far cry from the San Francisco earthquake of 18 April, 1906, which caused an estimated 3,000 deaths, and hundreds of millions of dollars damage. 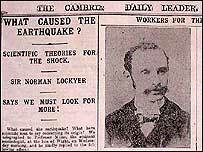 But under the headline An Earthquake!, the Cambrian Daily Leader of 27 June carried reports of "Swansea being thrown into panic" with "confusion in the schools, terror in the homes." The clerk at Swansea Post Office described watching the counter shake, many people dashed from their homes with several escaping from upstairs windows while miners at several collieries were brought back to the surface. Llanelli's town hall clock stopped, people in Ammanford thought there had been a huge explosion and children at one school in Merthyr Tydfil ran in panic into the streets. But the paper was able to put one "unfounded rumour" to bed. "A telegram came this morning stating that half of Fishguard had been destroyed," it reported. "We wired the vicar for confirmation and he has been kind enough to reply 'earthquake shock 9.45am - no damage done'." Bryngwyn Williams, who has put it together, said: "It was quite a substantial earthquake in terms of what it measured on the Richter scale. "A large number of people do appear to have panicked but it did not cause that much damage to Swansea itself. "Chimneys fell over and some ornamental objects fell off buildings. There were one or two minor wall collapses and ceiling collapses but nothing major and no loss of life." He said the epicentre was believed to be just off shore from Swansea and the effects were felt as far afield as Ilfracombe and Birmingham. "It seems to have been across the city - there was some damage to Mumbles - the lighthouse rocked on its foundations apparently. "Apparently one chimney on every other house in one street in the city fell down so the damage was quiet widespread." He said while the library's archive showed widespread reporting in the initial few days following the earthquake the papers appear to have lost interest quickly and never returned to the story. "There are those with an interest, like the British Geographical Survey who monitor earthquakes and have posted the event up as being one of the most damaging earthquakes in British history, but by and large it does seem to be forgotten," added Mr Williams.